Sarah Nader - snader@shawmedia.com Johnathan Rios (left), 13, of Poplar Grove shucks corn he helped harvest from his families garden plot at the Community Garden at Hill Farm Acres in Crystal Lake Thursday, Aug. 10, 2017. The family cuts and freezing the corn to be used the rest of the year. 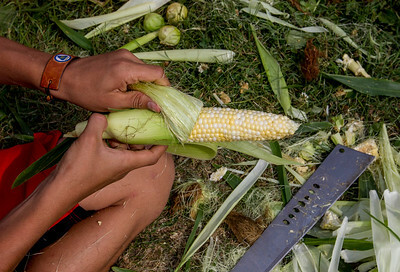 Johnathan Rios (left), 13, of Poplar Grove shucks corn he helped harvest from his families garden plot at the Community Garden at Hill Farm Acres in Crystal Lake Thursday, Aug. 10, 2017. The family cuts and freezing the corn to be used the rest of the year.